Georg Wilhelm Steller was a highly influential 18th century German naturalist who explored the coasts of Russia and Alaska. During his career, he described many species, including the northern fur seal, sea otter, Steller’s sea lion, Steller’s eider, spectacled cormorant, and the now extinct giant Steller’s sea cow. In addition to his many observed findings, he also described a fat, hairy creature with a dog-like head that he termed Simia marina, the sea ape. 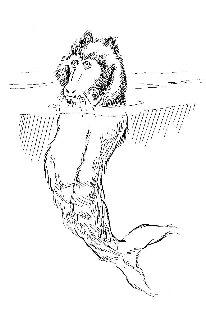 The only notable record of the sea ape is in Steller’s description. No reputable sightings have been made since then. In the biography of Georg Steller, Steller’s Island, a juvenile northern fur seal is listed as the most likely culprit for this misidentification. Other theories put forth are that of a sea otter, a deformed fur seal, or a wandering monk seal. What’s exceptional about the sea ape, and why this sea monster still persists after many centuries without a sighting, is that Steller was not an amateur observer or an unreliable source. Steller was one of the best naturalists of his time, and his species descriptions are still highly regarded. In his report he describes seeing the animal multiple times and even trying to shoot it (he missed). Given that, it doesn’t seem likely that he would misidentify something as common as a fur seal. There’s a more likely explanation when considering the whole of Steller’s work. The sea ape was recorded in his book, The Beasts of the Sea, but there was no mention of the encounter in the ships log, nor did the sea ape appear in Steller’s official report of the expedition. It may come as a shock to some of you, but biologists do have a sense of humor. I have a colleague who’s been try to name a polycheate genus Langerus (Latinized Irish slang for ‘wanker’) so that he can describe the ‘fat wanker worm’. One needs only to look at naming conventions for genes to see that some of us are a little twisted. Whether a misidentified marine mammal or a great practical joke, the novelty of Steller’s Sea Ape earns it a spot on our list of favorite sea monsters. Steller’s sea cow, was probably one of the first animals to be hunted to extinction by humans. I am not an expert on the matter but from what I know, native Alaskans used its watertight skin to build their kayaks. Georg Wilhelm Steller first described the animal in 1741 (one of the only descriptions to date)and twenty years later it was declared EXTINCT. Hunted to extinction because it was a slow mover and its fat provided an alternative to whale oil.